Last week's post concluded what was essentially my pilot episode. It was a weekly three part series that took a slight detour as local news took precedence. Another three part series is in the works, but before that I am going to be on vacation; FOR THREE WEEKS! I still plan on sharing in that time, but the posts will likely be more of a Pinterest format. Pinterest, the reality TV series of social media. Don't feel like putting in the time and effort to write, just copy and paste some pictures. I can't really be against the practice (especially since I said I was going to do the same thing). Each social media company tries to fill a different niche market and I use the ones that suite me. I am much more a fan of other social networking sites. Namely, 80% Twitter, 10% Facebook, 8% Google+, 2% LinkedIn. If you did not notice from my last series, I go under the geek grouping of Google fanboy. As such, several of their features get used. Blogger, the host of the page you are on now, is owned by Google. Out of sheer convenience, whenever I have a new post it gets a mention on my Google+ account. Some recent demographics: The vast majority of Google+ users are likely male. The vast majority of Pinterest users are female. So if an online cross-platform mixer was held, there would be enormous potential for the world record of group sexting. I also use their news site to get caught up on the big stories. 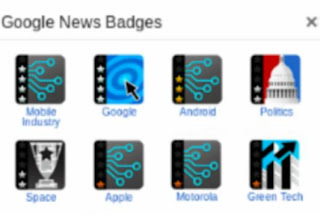 Actually, my badges probably give a decent account of my interests. Of course, since everyone else is there, I am on Facebook. Just as the Bible name literally means The Book, a movie came out declaring Facebook as The Social Network. No, I do not want to plant a tree in "Farmville". I have not ever gotten in to "Mafia Wars". I am probably some form of a typical user here, simply checking friends' statuses every once in a while. For several years I was against Facebook because in contrast to Google's 'Don't Be Evil' motto, several articles seemed to come out depicting Facebook as despicable. Google could practically equate their motto to 'Don't be Facebook'. There was the expression of the Facebookification of the web, a notion that is horrible to me. Facebook seems to be more secretive than others about how they use your data. Google gets attacked from all sides because they blatantly tell people how their data is being used and make it available to people to use in creative, if creepy ways. To see your data, just search 'Google Dashboard' in Google. The description of the first link even says, 'Review your personal data'. Inside the dashboard you can explicitly tell Google how you want them to use your data. 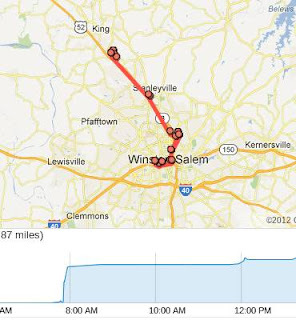 I turned on location history. I rarely use it, but it is interesting. 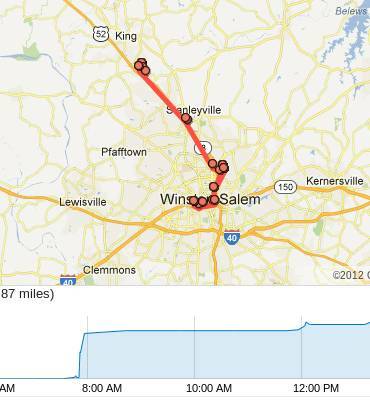 Below is a screen shot of my Google Latitude History showing what I was doing a year ago today. On the other hand, Facebook just recently went through becoming an IPO. All the machines malfunctioned that allowed people to conduct their trades. The biggest people to be impacted were the large traders. Facebook, who in essence serves 99% of people, beat Wall Street at its own game. That is incredible. And I have not heard others allude to this, but Facebook, who employs some of the brightest computer programmers around goes IPO and machines involved in trades go down. If there were individuals involved in the crash, first, that would be an incredible story, second, it helps make up for the bad publicity Facebook has received in the past from my perspective. And then there is Twitter. I was surprised when I wrote this, because I never thought about how much more regularly I use Twitter than other networking sites. There is a sort of instant gratification to scrolling through and finding an interesting topic. Actually, I believe I read an article linked from Twitter about why I navigate more to it. Most companies use gamification to get users more actively involved. 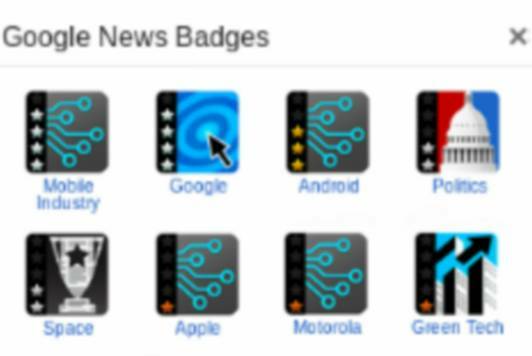 Google's news badges, that is gamification. Am I beating others to be the most interested in a topic!? There is an occasional positive reinforcement. But it is the randomly timed instant gratification that makes Twitter addictive. In comparison, consider the number of slot machines in a casino to the number of black jack tables. I chose my Twitter handle, @NerdistNewsome, because it described the type of people I was most interested in following and the type of tweets I would be tweeting. Also I liked the rhythm and alliteration. Originally, I had no idea what I was doing or who to follow. But slowly I learned or Twitter improved their discovery features and now I follow several major news sources of all levels of legitimacy. If you want the latest news first, use Twitter. LinkedIn is the infomercial of social media; You just set it, and forget it. I have signed up, filled in all the info, and get weekly notices, but I rarely go back to review. Finally, this brings me to my disorder; everyone's disorder. The list of social media sites that get listed on a page cannot go on forever. There is little room for competition, even if a better product were to come along. Already each of these social sites gets shown in a cascade of icons; each image slightly slowing down how fast a page will load. These are each incredible companies, but it is leading to a social stagnation as new comers have less of a chance to be seen.